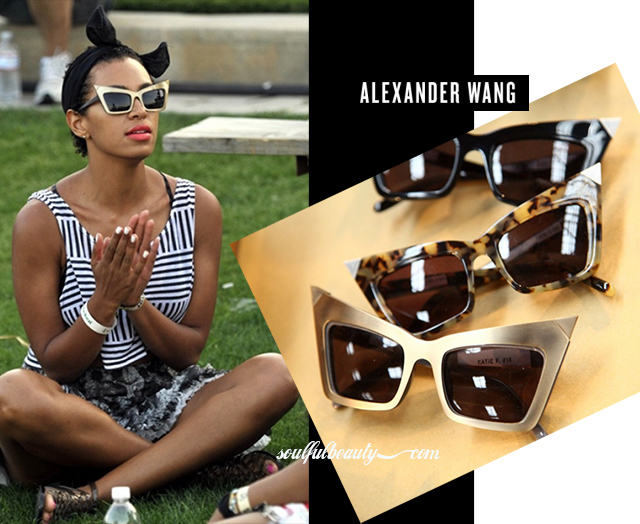 In this photo from Coachella 2010, Solange Knowles is shown wearing a hot pair of two-tone, gold and black cat-eye sunglasses by Alexander Wang. These sunglasses were made in collaboration with Linda Farrow, and feature exaggerated metal points. Although the photo is from 2010, the cat-eye sunglasses trend is one that is still going strong for Spring 2012. So, if you're feeling these shades, now would be a perfect time to cop a pair. And if the $300 price tag is too high, no worries, you can get the exact same look for $5 on the Material World website.